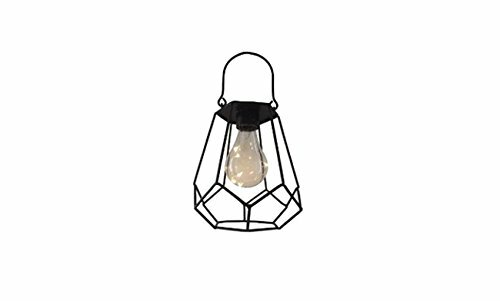 Chic solar powered Hanging Lantern made from black powder coated metal and included glass light bulb with LED lights. Perfect accent to provide pleasing décor during charging daytime hours and nighttime mood lighting for any outdoor occasion-birthday parties, weddings, cookout barbecues, bonfires, family gatherings and relaxing evenings on the patio. Made in 6 geometric styles (each sold separately) so you can mix and match to your preferences; Roughly 5" in diameter and is controlled by an on/off switch. Metal handle makes it easy to hang on hooks, stakes or use as trellis lighting. No installation or set up necessary; When set to "on", light will automatically turn on in the dark. If you have any questions about this product by ReLive, contact us by completing and submitting the form below. If you are looking for a specif part number, please include it with your message.